The award show featured some of the biggest and boldest infrastructure projects, with the aim to uncover and celebrate some of the UK’s most inspiring, innovative and collaborative technology. It provided a fascinating snapshot of some of the trends that are defining modern engineering and also highlighted the degree to which industry and academia are collaborating to solve fundamental problems across a variety of sectors. 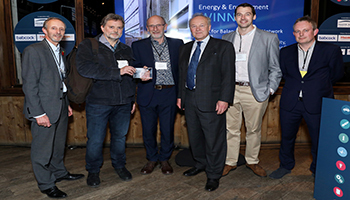 The BEN project, led by ICAX Limited at LSBU, won the ‘Collaborate to Innovate’ award, beating competition from the likes of Warwick and Exeter University. BEN combines next generation heat networks with smart-grid technology to balance the production of heating, cooling, and electricity in a way that minimises costs and carbon emissions. Find out more about the BEN project.